The Xbox 360 Kinect can be confused by large dogs and wildly flailing children. Those are two stress tests that Microsoft's controller-free add-on failed in a series of trials involving lighting, human and dog distraction, rubber masks and voice confusion. The audio and vocal tests returned mixed results, but everything else we threw at the Kinect it handled with flying colors. The Kinect uses a set of cameras and an IR sensor to detect player movement and translate it into gameplay. The question is, just how well lit, how perfectly lit does your room have to be for Kinect to work? Totilo took this challenge on, checking out the Kinect in the pitch black of his room at night and the bright sunshine of an early afternoon play session. Here are the results. First up: Bright light interference. Totilo set up his sensor so that sunshine landed directly on Kinect's cameras. Despite the bright light it was able to recognize Totilo's face and movements. Next, Totilo played Kinectimals in the darkness of his room with only the television illuminating his play space. The Kinect had no trouble tracking him when he played, accessed menus. The tracking guide box showed that it could see his hands, upper body and head with no problem. The one issue that Kinect had was recognizing who Totilo was in the pitch black. To be fair, the Kinect suggests you do multiple ID tests with it in different lighting conditions. Also, it was pitch black. 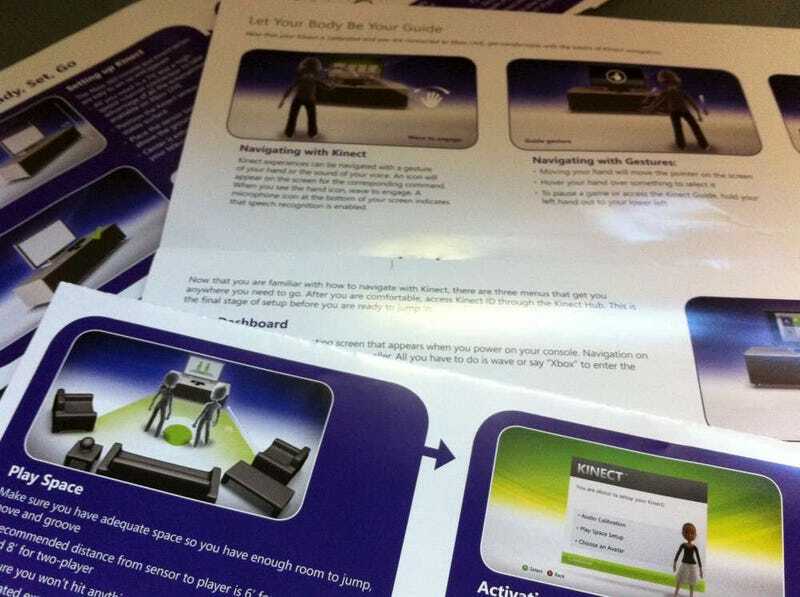 Kinect warns players that they may need to change clothes to play Kinect. What? That's crazy! I've tried playing Kinect with a t-shirt and jeans, in baggy sweats. Tristan and friends have tried it in an assortment of typical tween clothes. None of us had issues. But what if I, say, wanted to play Kinect in my giant fuzzy, unbelted robe? While the robe seemed to slow the Kinect's reaction down time a hair, it still worked surprisingly well. It even worked, sort of, when I started swinging the robe about wildly as I played. Good job Kinect. OK, clothes and lighting, they really shouldn't cause problems with a controller. If they did there would be serious issues. But what about other people... and dogs? We don't all play video games in plastic cubes, some of us have other people wandering around when we're playing games. Some of us have three dogs, including a Great Dane. What happens when they get into the mix? Tristan has never been the same since failing to interfere with my Move game playing. I decided to give him a second chance, this time with Kinect. How'd he do? When he walks by it causes no problems, but when he stand or runs in front of me, arms waving, it totally screws up the Kinect. TOTALLY! Take away: If someone wants to, they can completely screw up your Kinect gameplay. In the eyes of Kinect Edgar Allan Poe is not so much a dog as he is a furry 120 pound person crouching on the ground. Does he mess up gameplay? Absolutely, but my wild flailing scared Poe away everytime, so I don't know how big an issue it will be. The little dogs, Thumper and Littlefoot? They didn't seem to cause any issues. If you have a curious dog and a game that does simulate what must appear to them like smacking a dog in the face, it could be an issue. Yesterday, when I mentioned that I would love to have parental controls tied to the Kinect's ability to recognize people, a lot of you started talking about the idea of disguising yourself to trick Kinect. So Totilo decided to test whether Kinect could recognize a rubber mask. Disguised as Kratos, God of War, Totilo was unable to get Kinect to recognize him. Once he whipped the mask off, it could recognize him, supporting the theory that Kinect really does look at your face, not just your body, to identify you. The facial recognition is the most confusing, but also one of the most interesting, abilities of Kinect. Kinect isn't just two cameras and an IR sensor, it's also an array of microphones. It uses those microphones to actively listen for key words that can be used to control the system. But how well does it handle fast talking, different voices and different accents? The Kinect manual tells you, you need to say "Xbox" and then say one of the words that pop up on the screen. The thing is, that means there's a bit of a delay. It's a slower than normal talking experience. What do we learn here? Well the Kinect wants a clear voice, it also seems to do a better job interpreting when you speak slowly and break up the attention word and the command word, at least in loud environments. Oh, it also doesn't recognize the words Nintendo or Kotaku. What about when your son decides to interrupt your movie watching? What about... voice griefing? This was the last stress tests we did. We wanted to see what would happen if one person used voice commands to start a movie and another tried to then interfere. The results? Surprising. I'm not sure if it was intended but Tristan was completely unable to interfere using his voice. He tried different positions, shouting, using a deep voice. The only time it recognized his voice was when he started the video. One other possibility is that the Kinect has trouble recognizing children's voices, and that's made worse by the loud noise of the movie playing. We have no video showing this off, but last weekend my son brought five of his friends over. They spent the afternoon playing Kinect games, running around, bouncing all over the place and lounging on the couch directly behind the player. From what I saw there movements behind the player causes no issues. It was only when they got up and ran in front of the player that it caused a momentary interruption. We also haven't tried physically abusing the Kinect array, letting it drop on the ground from the top of a television, kicking it or hitting it with a flying Move or Nintendo Remote controller. So far, the Kinect seems pretty good at deciphering what it needs to pay attention to from the stuff going on in most family rooms. It has some issues with voice commands and hates when extra people deliberately get in the way of the player, but light and clothing seem to make little to no difference. Read our Kinect reviews here and the rest of our Kinect coverage here.